French Oenologist, born and raised in Barcelona. Studied Oenology and Viticulture in France, Toulouse and Bordeaux, ended his studies with a Master delivered by the Faculté d'Oenologie de Talence-Bordeaux. He then worked in France, Italy and Spain. He became technical manager in Chile for Francois Lurton and successfully converted the vineyards into organic viticulture, and was finally appointed as South American Technical manager based in Mendoza for both operations in Chile and Argentina. Fluent in 5 languages, with winemaking experiences in 3 continents, he is a recognized wine blender. He has succeeded in delivering large volumes of wine from Chile and Argentina to the most important wine buyers in the USA and Europe, as well as Asia. Chilean Winemaker, with extensive international experience, Sebastian has created wine projects from beginning to end and is a talented taster and blender. He has worked as a consultant for boutique wineries and has developed extensive knowledge of local suppliers and networks in Argentina and Chile. He has been in charge of responding to wine requirements involving every quality level, from high end wines to low end wines. He has extensive commercial experience and a profound knowledge of developing new wine brands in different markets. Among his latests experiencies he was appointed as technical manager for Argento Wine Company, the leading wine brand from Argentina. Claudio has been involved in many different areas of the Chilean wine industry. His thesis was a complete analysis of the wine export market. 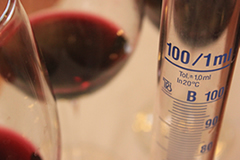 He then collaborated in diverse wine projects for CORFO, the Chilean government's production development corporation. After this, he was in charge of generating periodic statistical analyses and information for CHILEVID, an association of producers of fine wines for exportation. He continued to expand his expertise in the wine industry as project engineer for the Corporación Chilena del Vino (Chilean Wine Corporation). Claudio has also undertaken private ventures in the wine industry. His academic and professional experience in conjunction with his experience as an entrepreneur have given him a keen understanding of the value of opportune, accurate, and reliable information for Chilean wine producers. This insight led him to create the Wine Export Industry Intelligence Modular System in 2005. As a result of a complex process of induction, learning, and improvement, in 2007 this system evolved into today's INTELVID Ltda., a company pioneer in its field, designed to provide the Chilean wine export industry with statistical data. Probulkwine © 2019 | Your Strategic Wine Source. | Load: 1.2 ms.